Do you want to share a map presentation and add it to your website or blog? 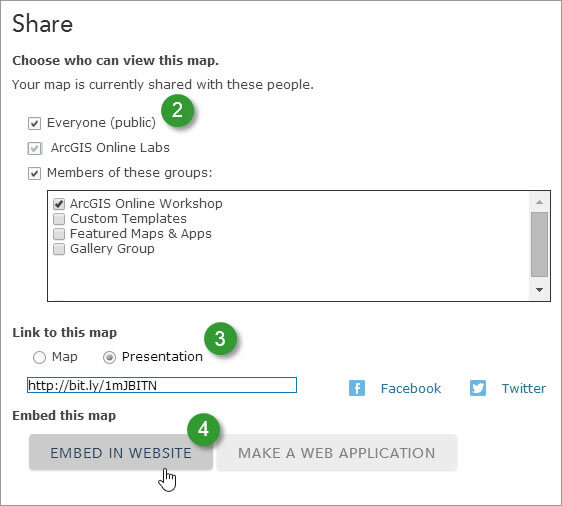 One way to do this is to use Share in ArcGIS Online, which provides the HTML you need and enables you to set options for the embedded presentation's size and links to a larger view. Step One: Author a presentation and save it with your map. Step Two: Publicly share your map by checking Everyone. 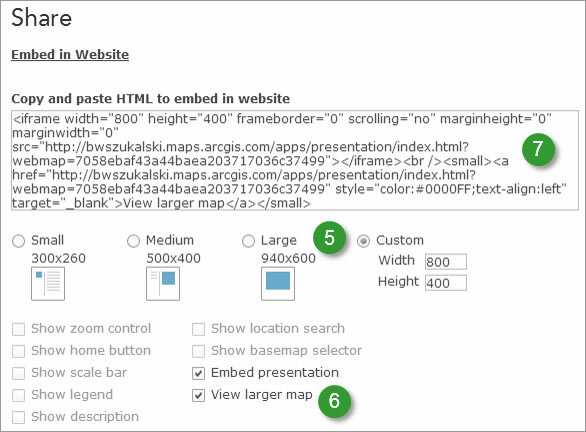 Step Three: In the Link to this map section, choose Presentation. Step Four: Click Embed in Website. Step Five: Select a size for your presentation. Step Six: Decide if you want to enable View larger map. This creates a link to open your presentation in a new web browser tab or window. Note that Embed presentation will automatically be selected.